Perforated plastics are lightweight, corrosion-resistant, and cost-effective materials. They are ideal for use in a variety of applications such as speaker covers and acoustical lining materials. 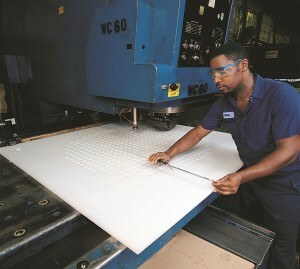 McKey supplies perforated plastics that are flat and easily formed or fabricated to shape. Because of our many years of perforation experience, we have the ability to skillfully handle plastic sheet perforation to draw peak performance from these materials. Perforating plastic materials comes with its own unique set of challenges. Plastic materials vary widely in their reaction to perforation. Some become wavy, while others will shatter, crack, splinter, fray, or discolor. Our materials experts work with our customers to minimize difficulties and maximize performance in a completed component. Because plastics cannot be leveled or flattened, precise tooling and proper clearances are critically important. McKey’s in-house tooling experts can create custom tools for these applications. McKey operates a selection of plastic-only equipment, designed to run in an oil-free setting for minimum compromise of finished components. We will provide design support and technical assistance to ensure a functional, consistent, and cost-effective end product.